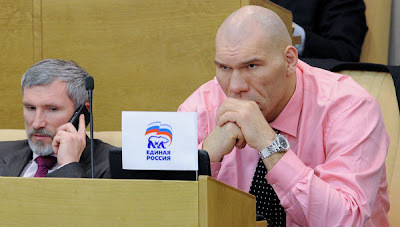 "Hey found bigfoot in Russian Parliament, this photo confirms coned head, distinct brow ridge, long upper lip, hooded nose, high shoulders, sloped back, bipedalism LOL his name is Nikolai Valuev a former heavyweight boxer hes 7 ft tall and is now a member of Russian parliament pretty uncanny LOL" - Mario Ishisname-o. Thanks to Mario Ishisname-o for sending this to us. The photo above is Russian retired heavyweight boxer Nikolai Valuev, who was elected a parliament deputy from the ruling United Russia party in December. Last September, the heavyweight boxer embarked on an expedition to find the Russian Yeti. The territory he chose was near the Azaa Cave. According to many witnesses, the area is prime Yeti territory. Along the way, he managed to find "traces" such as broken tree branches and gigantic footprints. A local government press release wrote: "By the time they reached the Azass cave, the expedition saw gigantic footprints, similar to a human’s." Although unsuccessful at finding the Yeti, Valuev's trip to the region was a media success, supported by the ruling United Russia party. Many suspected that the Yeti expedition was probably part of a concerted effort to boost tourism in the region. When asked whether it was hard for him to adapt to his new job as member of the parliament, Valuev said: "Probably most sportsmen cannot quickly adapt to this work, but I seem to be of a different breed." CASE CLOSED! Just proof that a squatch with alopecia can co-exist with...well, the Russians. Rumor has it Biscardi is already on a plane to go get this guy signed. Quick! Someone send his DNA to Dr. Ketchum! Valuevs trip to find the Yeti is more likely a trip back to get acquainted with his ancestoral roots. His head bears a striking resemblence to a Bigfoot. The stories of Zana must be true. Great great great grandchild? lol. That guy has one hell of a sagittal crest. Not a sagittal crest; it's an occipital bun. Look at the second photo-the head is normal in it. The weird angle of the first shot throws it off. The Russians are neanderthals! MCCARTHY WAS RIGHT! RIGHT I TELL ! If that does not look like descriptions of Biggie without hair I don't know what does! Let's hope he doesn't grow bushy hair and beard and walk around in a fur coat! I'm not believing any of this until we get a FB/FB confirmation. They need to confirm that he smokes cigarettes, likes pancakes, hops boxcars, can communicate telepathically, can build stick structures and birthing stations, refuses to eat cows and owns a mountain bike. He appears to be white, though, so M.K. must be excited. And can hold his breath! Study his DNA!!! Sorry but is he %100 HUMAN?? He even admits it: "...I seem to be of a different breed." It's a confession! Where are you now, skeptics!? 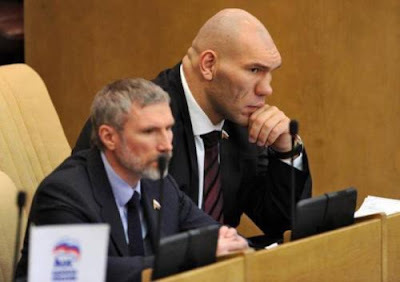 The Sierra Kills sketch is right next to the big Russian on this page, my gosh if Valuev had black hair all over his head and face he could be the Sierra Kills victim! Who's gonna step up and carve a steak? Here you go Dave, scroll down through the article and lots of pictures. Loves Mozart and writes poetry, there's a picture of he, his wife and son at the very bottom. Whats this guys shoe size? Most people have a forehead. This guy's got at least a fivehead. I dunno... could be a bear with mainge. Either that or the bridge he was living under collapsed due to economic cut backs and forced him into the limelight. That is one HUGE DUDE! Looks like one of the many guys Sharon Lee slept with. You are never gonna see a bruiser like that with a woman who is less than lovely...interesting. I'm really impressed together with your writing skills and also with the format to your weblog. Is that this a paid topic or did you customize it yourself? Anyway keep up the nice quality writing, it is uncommon to see a great weblog like this one nowadays.. I know exactly how you feel and I've felt the same way. You have to break down exactly how you want to earn money online.